The Turbo Aluminum Core Wheels feature a CNC-machined aluminum core - for precision bearing fit and superior wheel alignment through critical turns. The precision hub and superior urethane offers amazing grip and traction - allowing the rider to take more agressive lines while maximizing speed and roll. Available Upgrade Option for Completes: Turbo Aluminum Core Wheels are an available upgrade on all Sk8Kings Axe Series, Blaster and Mini-Shredder Completes -- Woody or Ultimate! Also available in Turbo Composite Core version - which are part of our standard build for Sk8Kings longboard completes. 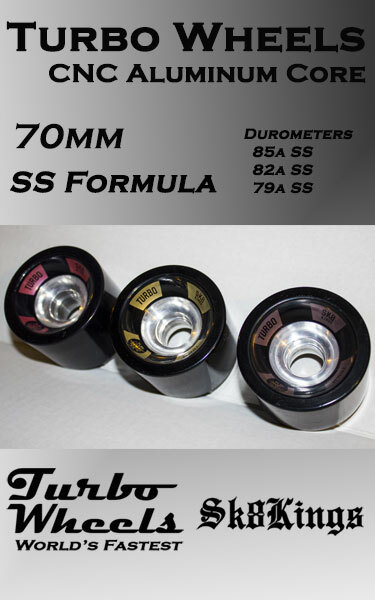 Bearing Recommendations: Turbo Aluminum Core Wheels are designed to work with standard 8mm sized bearings. We recommend using high quality bearings (such as Oust Moc 5, 7 or 9) with separate steel bearing spacers (8mm x 10mm) for best performance. Be sure to carefully align bearings and press in straight.